Senate Republicans reversed course yesterday and plowed ahead with their plan to repeal and replace the Affordable Care Act — ignoring all the experts, actuaries, independent analysts, governors and even voters who say their bill would lead to millions of people losing insurance and make it harder for sick, poor people to obtain coverage. Aides are frustrated and candidly skeptical that a deal is achievable at this point. One senior GOP aide referred to the bill — as well as a straight-repeal bill the caucus is now also considering — as "corpsicles." Another aide said, "It's a terrible idea to make people vote for the 2015 [repeal] bill" and that last night's attempt to revive the replacement bill was a "death rattle." "They can't accept they've been promising something that is undeliverable and a bad idea for seven years," one well-connected former GOP aide told me. Bottom line: Congressional Republicans aren't listening. They're ignoring health care experts, industry groups, governors from both parties, and voters. Many of them seem to have decided passing something — anything — is better than failure. The irony is that if they succeed, and everyone else was right about the effects of this bill, they'll own the disastrous consequences. Either way, it looks very much like they're about to be forced to go on the record on one of these bad options. "Governors, industry and policy experts are not really the right experts for the problem at hand. This is no longer about salvaging what is left of the individual market. This about salvaging what's left of the Republican Congress," one health care lobbyist said. Two bad options: It remains unclear what the Senate is actually going to vote on next week. It might be the latest Senate bill — or a version of it — which restructured some parts of the ACA and dramatically overhauled Medicaid. It might be their 2015 bill, which repealed large parts of the ACA without replacing them. It might be both. If there aren't 50 votes to begin the substantive voting process, it might be neither. Earlier this month, the Kaiser Family Foundation found that 61% of Americans viewed the GOP replacement plan unfavorably, with only 28% viewing it favorably. The same poll found that only 26% favored the repeal now, replace later strategy. An AP poll found only 13% of the public favored repealing the ACA without a replacement ready. 22 million more people would be uninsured by 2026 and 15 million more next year, compared to current law, according to the Congressional Budget Office. Markets would be relatively stable, but in some places, no insurers would participate in the individual market, or would charge very high premiums. Premiums would rise in the short term, then fall; deductibles would rise across the board. On an amendment offered by Sen. Ted Cruz (allowing insurers that offer ACA compliant plans to also offer non-compliant plans) that was included in the most recent version of the bill:"This would allow the new plans to "cherry pick" only healthy people from the existing market making coverage unaffordable for the millions of people who need or want comprehensive coverage," America's Health Insurance Plans and the Blue Cross Blue Shield Association wrote in a joint letter.The American Academy of Actuaries: "Rather than having a single risk pool, in which costs are spread broadly, there would be in effect two risk pools—one for ACA-compliant coverage and one for noncompliant coverage. As a result, average premiums for ACA-compliant coverage could far exceed those of noncompliant coverage, thereby destabilizing the market for compliant coverage." Per CBO: 17 million more Americans uninsured next year, 32 million more by 2026Premiums would rise by 25 percent next year, 50 percent by 2020 and 100 percent by 2026.By 2026, about three-quarters of the population would live in places with no insurers participating in the individual market. A bipartisan group of 11 governors: "The Senate should immediately reject efforts to 'repeal' the current system and replace sometime later. This could leave millions of Americans without coverage." Catch-22: McConnell brought this bill up knowing these would be the consequences. But most of the caucus has already voted yes on this bill, so flipping their votes would earn them accusations of playing politics. But, but: It's now apparent congressional Republicans can't coalesce around a replacement plan, unless something changes quickly. So saying you'll vote to repeal now and then will come up with a replacement plan later isn't a strong justification. Who is happy: Conservative advocacy groups. They're especially pleased with the prospect of straight repeal. It's becoming very apparent that theirs is the loudest voice in the room. 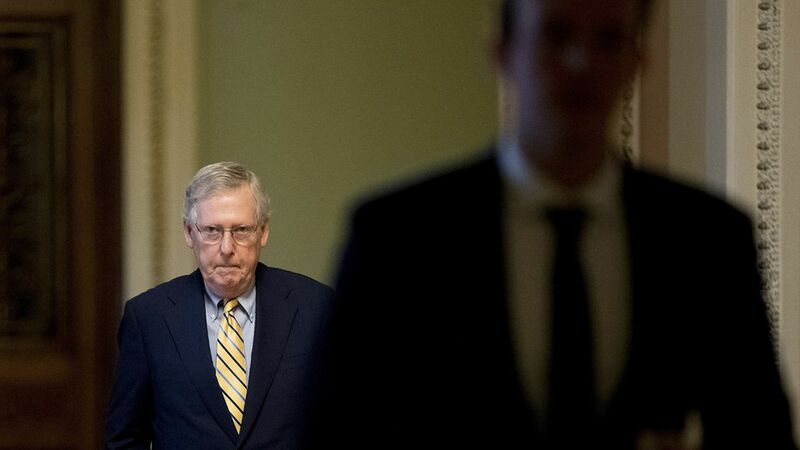 "McConnell will always protect his right flank," one former Senate GOP staffer told me.